At last year’s Village Fair Days, from left, Attorneys John Tower and Abigail Miranda, former Intern Claudia Taylor and Attorney Barry Moller. Stop by the tent outside Cramer & Anderson’s office on the Green in New Milford July 29 and 30 during the 49th Annual Village Fair Days, sponsored by the Greater New Milford Chamber of Commerce and held on the Green. The town’s largest annual event, Village Fair Days is a community celebration that draws thousands of visitors over two days featuring nearly 200 booths set up by vendors and community organizations, along with live entertainment, Bingo, bouncy houses, and a food court. This “summertime destination for shopping, socializing, eating, and browsing,” as the Chamber calls it, takes place Friday and Saturday, from 10 a.m. to 10 p.m. each day. Admission is free. 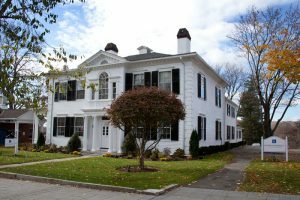 The Cramer & Anderson tent will be set up on the lawn in front of the office on Main Street, located in the historic 1793 Elijah Boardman House, whose namesake was an important post-Revolutionary War era businessman, U.S. Senator and real estate investor. A view of Village Fair Days visitors on the Green. Photo courtesy of the Greater New Milford Chamber of Commerce. “We’re going to hand out mouse pads and contemporary styled backpacks for children each day,” said Cramer & Anderson Senior Partner Ken Taylor. Visitors who stop by can also pick up information about the regional firm with a reputation for offering “sophisticated legal service close to home.” And attorneys can “pop out” of the office to answer any specific questions visitors have, Attorney Taylor said. Cramer & Anderson also has offices in Litchfield, Danbury, Washington Depot and Kent. For more information, call the New Milford office at 860-355-2631 or see the website at crameranderson.com.